Sara Mills works with the Raku (pronounced rakou) firing technique. No two pieces can give the same results - vibrant colours, iridescence, intriguing finishes and crackles are some of the results that can be attained through this technique. Each piece is created, glazed and fired by hand in her studio in Pigeon Hill, Quebec. 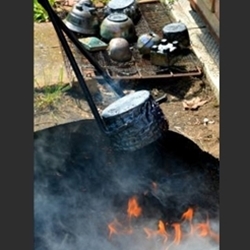 The raku firing technique originated in 16th century Japan. It was used for the production of bowls for the Tea Ceremony at that time. The rituals are close in philosophy to Zen Buddhism: beauty and simplicity. It is currently a technique that is used internationally. After the clay has been formed it is bisque fired in an electric kiln. The pieces are then glazed with glazes that are specially mixed for the raku firing. The glaze firing takes place in a small outdoor kiln which is heated to the melting point of the glaze (1000 C). While the piece is still red-hot it is removed from the kiln with tongs and placed in a metal container filled with sawdust or other combustible material (newspaper, pine needles, leaves…). The sudden change in temperature crackles the glaze. During this process flames and smoke envelop the work creating flashes of bright lustrous colours. The cooled pots are then scrubbed to remove the soot. Only a few pieces can be fired at once. All pieces are unique.